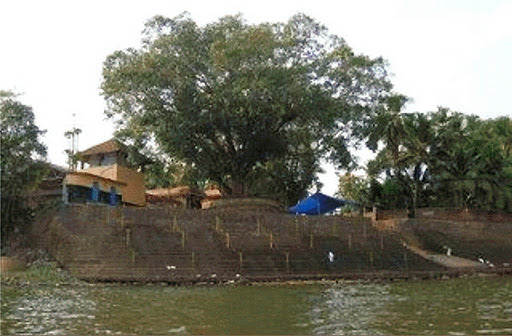 An ancient temple dedicated to Nava Mukunda, a form of Lord Vishnu is located at Thirunavaya, on the shores of Bharathapuzha. It is believed that the idol installed in this temple is the ninth idol installed by famous saints known as Navayogis. Legends tell that first eight idols disappeared as soon as they are placed and the ninth one sunk up to knee by which time it was forcibly stopped. This place in Thirunavaya is full of soft sands and was the location for the great festival known as “Mamankam”, the warrior fights held once in 12 years. Mamankam was the assembly of royal family members and was for 28 days. Devotees come to this pristine sandy beach to offer last rites to the loved ones. There are other temples with deities as Shiva and Brahma in Thirunavaya. In pasurams of Tirumangaialwar and Nammalwar, Thirunavaya is refered as Thirunavai, Lord Vishnu as Sree Nava Mukunda Perumal and Thayar (Mahalakshmi) as Malar Mangai Naachiyaar or Sirudevi. 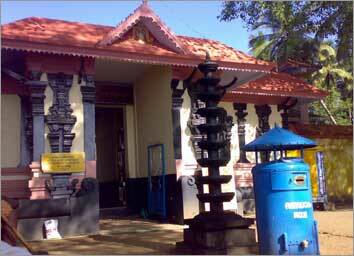 Thiruvanaya Navamukunda Temple, near Ponnani in Malappuram district is situated on the banks of the river Bharathapuzha. Thirunavaya was once the capital of Perumpadapu Swaroopam. It is indeed the cradle of culture in northern Kerala. Holding immense historical importance, this is the place where ‘Mamangam’, a grand assembly of the rulers of Kerala was held once every 12 years, in olden times. This extravagant festival was held for the last time in 1755 AD. The famous and ancient Thirunavaya Temple, known throughout the country as an ancient teaching-centre of the Vedas, was once plundered and destroyed by Tipu Sultan’s army. It was the Zamorin who repaired the temple later. This is the place were Nava yogis (Sathuvanathar, Saaloga nathar, Aadhinathar, Arulithanathar, Madhanga Nathar, Macchendira Nathar, Kadayanthira Nathar, Korakkanathar and Kukkudanathar) worshipped Vishnu. Vishnu gave darsan for Nava yogi. Hence this place is called Thirunavayogi and later changed in to Thirunaavaya. In due course, 8 yogis attained moksha and the vigrahams worshipped by them also disappeared and as a result of this, the ninth yogi got dejected and stopped offering worship to Vishnu. When questioned by Perumal, he said that he was missing his companions and Perumal with his maya showed the 8 yogis. The 8 yogis agreed to stay there but said that they would be invisible to human eyes and the 9th yogi could feel their presence. In due course, the 9th yogi requested Perumal to make him also invisible. But Perumal insisted that the vigraham worshipped by the 9 th yogi must be kept there itself and Perumal blessed the 9 yogis saying that they could offer worship to Him at that place forever. Hence, what we see now is the vigraham worshipped by the 9th yogi. Goddess Mahalakshmi and Gajendra (Indradyumna) used to offer lotus flowers for worshipping Perumal. As Lakshmi Devi would pluck the flowers for aaradhana daily before Gajendran, the elephant got dejected and approached Perumal and told that henceforth it had to go elsewhere to get lotuses for Perumal. As Perumal did not want his devotee to get dejected, He appeared before Goddess Mahalakshmi and Gajendran and said that Thayar could be with Him and accept the offerings made by Gajendran. Hence, this is the only divya desam, in Kerala which has a separate Sreekovil for Maha Lakshmi (Thayar). It is a usual practice in Kerala temples that after installing an idol, the Sreekovil would remain closed for 7 days with the belief that the devas would offer pooja to the idol. In this temple, first a vigraham was installed and the Sreekovil was kept closed for 7 days. But when the doors opened, they were shocked to see the idol missing. They again brought another idol and the idol disappeared. This went on for 8 times and on the 9th time, out of curiosity, when they opened the temple doors before the scheduled time, they were shocked to see that the idol had descended into the earth upto the knee. To prevent further descent of the idol, They immediately chanted various mantras and saw to it that the idol did not descend further. It is believed that when the idol would descend into the earth, Kaliyuga will come to an end. Thirunavaya is considered equivalent to Varanasi because of the presence of Shiva, Vishnu and Brahma temples. It is a well known story that Markandeya was destined to die at th age of 16. When Lord Yama came to take his life, the little boy ran into this temple and prayed to Perumal to save him. Perumal appeared before the boy and gave him a Shiva linga for worship and advised the boy to escape from the backside entrance. He assured that Lord Shiva would take care of him. As soon as Markandeya escaped from the backside, Perumal placed a big stone and closed the way permanently and ensured that Yama could not enter the way. To this day, the door behind Perumal remains closed. Markandeya worshiped Shiva near to this temple and the place where Lord Shiva gave darsan to Markandeya and killed Yama, is now famous as the Truppangottu Shiva Temple – one among 108 Shivalayams.